With significantly less effort and cost, InSpire provides the majestic character of natural slate while surpassing its performance. 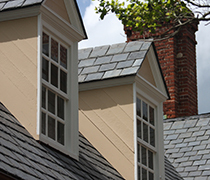 InSpire impresses with the true authenticity of slate to create memorable roofs on extraordinary homes. InSpire is available in an industry-leading spectrum of 31 colors. Our vibrant colors can be used exclusively or mixed and matched for sophisticated, one-of-a-kind style. InSpire is decidedly advanced in its engineering and versatility, with its old world charm. It is the only compression-molded slate tile in the industry, crafted using slate molds so that every detail of layered edging and unique surface texture is genuinely true to life. Our quality aesthetics come with the protection of a limited lifetime warranty and outstanding durability; 110 mph wind uplift rating, Class 4 impact resistance and Class A fire rating system. InSpire is UV-protected and impermeable, and will not fade, crack or curl.